Subterranean Termites are wood destroying (eating) insects that live in the soil. They typically nest approximately 4 ft. below the surface of the soil, but can nest as much as 12 ft. or more below the surface. Termites live in colonies which can contain several thousand members and up to several hundred thousand members. These insects have a “caste” structure which means that each “caste” has a different function to perform, as well as, a different appearance. Swarmers appear in the Northeast usually in April and May. It is not unusual to have swarmer sightingsas early as February if there is an early thaw. After a swarm, the kings and queens mate and form a new colony. Swarmers loose their wings soon after their brief flight. The presence of these wings indicatethat a swarm has occurred within the home or structure. Winged termites (swarmers) which are usually black in appearance, are often confused with carpenter ants. It helps to know the difference. Soldier termites protect the colony from predators such as ants. That is their sole purpose and will fight to the death to protect the colony. 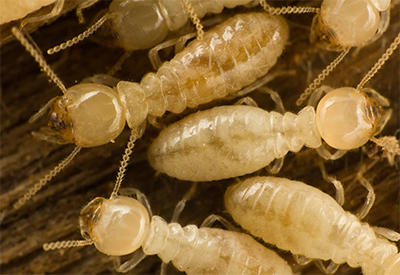 The worker termites are very numerous, are white to cream colored and are the providers for the colony. They are approximately 1/8th of an inch in length. They feed on wood or other materials that contain cellulose, such as paper, cardboard, fiberboard and some fabrics as well. A small organism lives in the digestive track of the insect. The protozoa helps to convert cellulose into nourishing food. Subterranean termites build “mud” tubes to shelter them from low humidity and affords them a controlled atmosphere. Termites can cause substantial damage over time, and unless you know what to look for, you may not be aware that you have a problem. Houses should be inspected at least once a year for evidence. This evidence could consist of damaged wood, mud tubes, swarmer wings, or “sounding” the wood to check its integrity. at info@arrestapest.com or call us at 1-800-338-PEST.